Next morning after an early awakening and breakfast everyone packed and left. The Christian welcome includes an early bed. It also includes an early rise so we all had to leave by 8am. Back through the town and back across the bridge built in the XVIthe century by François d’Estaing, the way divided. One route continued via the GR65 and the other, an alternate route, followed the GR6. I opted for the latter. It was a steady and sometimes steep climb to the ridge through fantastic forest. I walked on my own as was becoming more common. I found it more relaxing and I saw more. It was often difficult to match the pace of a fellow walker. Some people rushed and others were slower. It was distracting to walk and talk too. Many people had said that it is better to walk the Way of Saint James on your own. A form of meditation in many respects. I passed an older man who was panting a bit on a particularly steep section. He said he had no problems when I asked after him. I felt a bit of guilt not staying longer to make sure he was alright. Later that day I found out that he was 78 years old and just taking it easy on the steep section! The top of the climb appeared after a lot of narrow, steep and often muddy track. The path changed to a sealed road and after a few kilometres I noticed the red and white GR65 stripes seemed to point to the left. I followed. The path led through a wheat field and then into a wood. I had the feeling that it was not the right way but also had a deep feeling that it would be alright to continue. It was almost like I knew the way. The next village was in that general direction anyway so I was not too concerned. The path I followed was an old path: wide and well used (at least in the past). It descended into a steep valley winding down switchback after switchback to a small stream at the bottom. By now the path was becoming overgrown with fallen trees across the track. It was strangely calm when suddenly I heard a loud rustle and a black shape darted across my field of vision. I was not sure what it was but it may have been a deer. I continued calm and unruffled by the event with a sense of questioning and wonder. Soon I arrived at Campuac and sat in a cafe where I met Laurent and Herbert from Paris. Others, including Christophe arrived and we all had lunch in the town square. The gas stove was well used by all to make coffee after lunch. 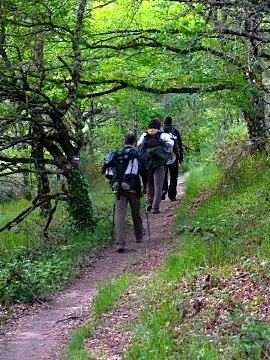 The Way continued and after a few kilometres re-joined the GR65 continuing on to Espeyrac. When we arrived at the Gite Communal, there were only two people already there. We had been told it was full. There was no ‘responsable’ so we set off to explore the church and town. It was a very small town with a lovely hotel and restaurant. The Church of Saint Pierre struck me as strange as the floor from the entrance to the church alter sloped uphill quite a bit. On returning to the gite, the lady in charge had turned up and said we could put mattresses on the floor. Christophe, Jacques and myself did just that and slept well that night. Laurent ate and slept at the good hotel!